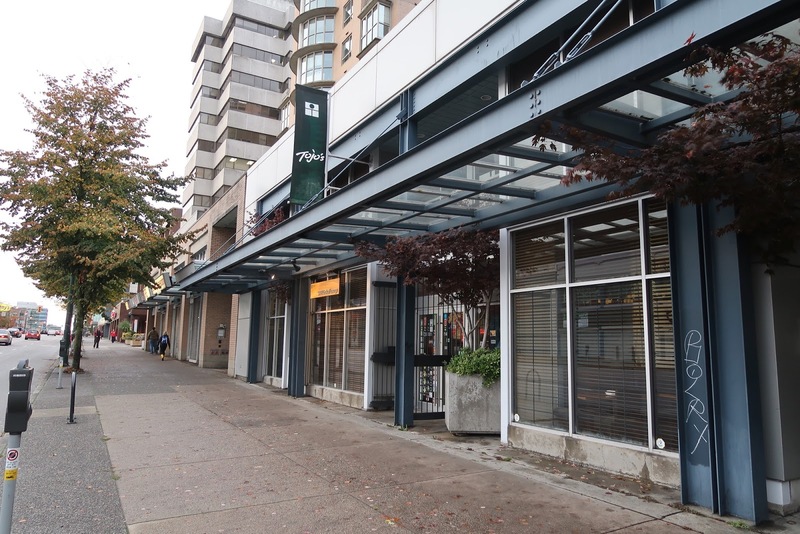 If I were to make an FAQ about me, the question "Have you been to Tojo's?" would definitely be near the top of the list. As much as I would have liked to answer "yes" to visiting what is perhaps Vancouver's most famous sushi restaurant, the prices there are not within the budget of any reasonable university student. A spicy tuna roll? $22. An order of Assorted Nigiri? How about $55? In all sanity, Tojo's would have been off limits for me until I got myself a well-paying job. However, there is a study that says not getting enough sleep is the same as being drunk. I've been averaging a paltry 4 hours of sleep per day since the start of the semester, and I suppose it all added up and resulted in me swinging myself into Tojo's to book a reservation for the priciest omakase dinner they had—the $150+ omakase at the sushi bar. Omakase refers to a special dining experience in which the selection of dishes is left entirely up to the chef. 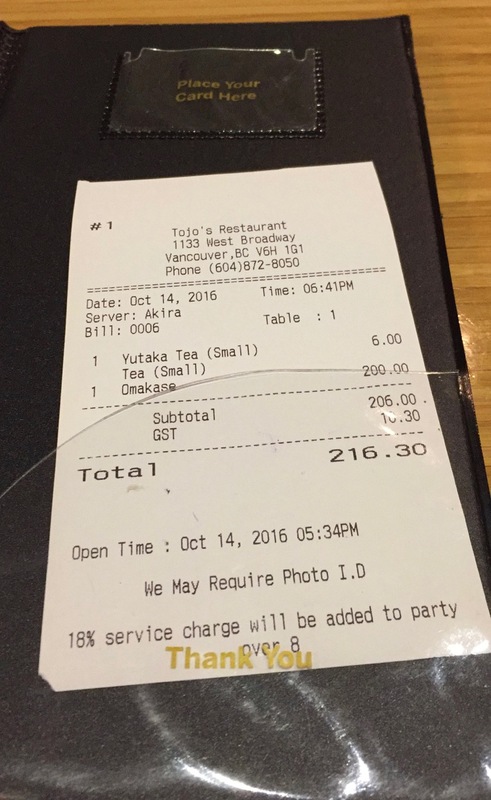 At Tojo's, the omakase at the bar starts at $150 and begins to climb as he serves you more and more dishes (you indicate when to stop). As this was such a high-profile dinner, I was determined to make it Episode #200 and not #201 or #202. Having already made arrangements for Episode #201 with a friend, I braved a windstorm that involved fallen trees and downed power lines to get to Tojo's, eager to bust the paycheck that I had received earlier that day. Inside the restaurant was one of the finest dining spaces I have ever come across. It was no measly sight—not only was the kitchen enormous, but there was enough seating for no less than 70 guests. There to greet me at the sushi bar was Chef Hidekazu Tojo, who is credited for inventing the ever-so-popular California Roll and BC Roll. Chef Tojo may not have a very loud voice, but he has the confidence of Donald Trump. 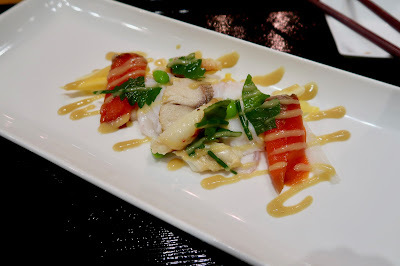 At the very beginning of the omakase, he made sure to reassure me that his food was "the best of the best." After that, much of my dinner was peppered with phrases like "very delicious," "this is excellent," and "you will definitely love this." He says these phrases with the tone and gestures of a wise, elderly philosopher. Although it may be perceived as arrogant, I think he does this to hypnotize people into believing that they are indeed eating "the best of the best." 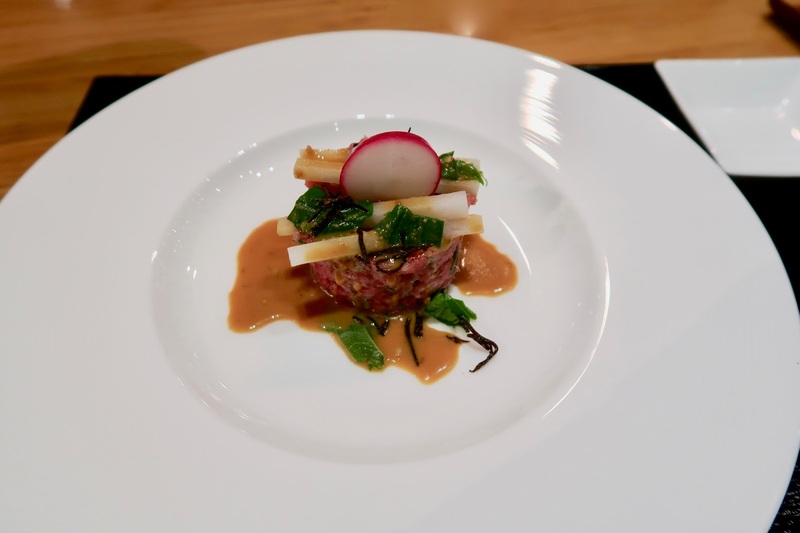 In the blink of an eye, Chef Tojo whipped out the Tuna Tartare, an appetizer featuring chopped tuna dressed with Tojo's special sauce. The sauce was a harmonious blend of gomaae and ponzu and was a perfect match for the soft, savoury tuna. Mixed within the tuna were very finely chopped green onions, which added a refreshing, energetic zing to the dish. 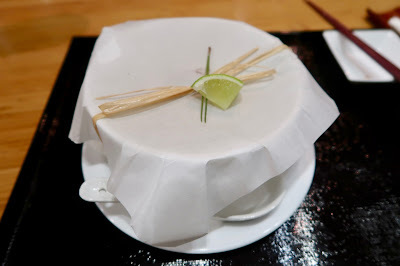 On top were a few pieces of crunchy daikon, which Chef Tojo told me were added for a textural contrast. 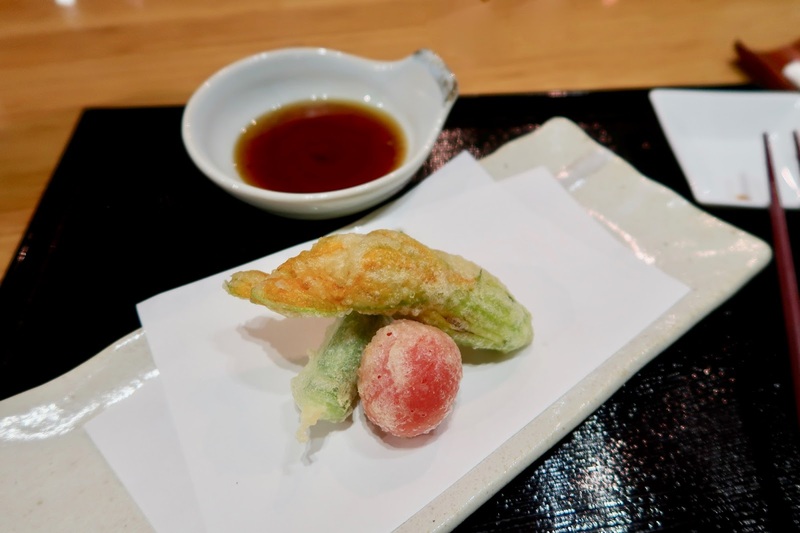 The next course consisted of Zucchini Flower Tempura with Scallops, Cherry Tomato Tempura, and Okra Tempura. The tempura batter was precisely made with the right thickness and texture. The zucchini flower had a green onion essence was filled with soft scallops, though the scallops were not especially rich in flavour. The cherry tomato was so juicy that when I bit into it, juice flew out of my mouth and splattered onto the tempura lining paper. Whoops... The okra was also a delight and contained just the right amount of moisture. Next up was a Seafood Salad containing wild salmon, sliced octopus, Dungeness crab, and mackerel dressed with mustard miso sauce and graced with a few slices of apple and daikon. I enjoyed the contrast of fruity vs. seafood flavours. The octopus was remarkably soft, while the Dungeness crab had an excellent silky texture. The sockeye was a little weaker and could have been smoother. However, the mackerel had the most amazing flavour of any mackerel I have ever had. It was rich with almost a hint of smokiness in it, yet not the slightest bit too salty. Steamed Canadian Sablefish - before uncovering the paper "lid"
In addition to making sure I knew that his food was awesome, Chef Tojo also made sure that I remembered to take photos of his food. Yes, by this point, there were already a few horrendous near-tragedies in which I picked up my chopsticks before my camera. When he presented me with this dish, his instructions were very clear: take a picture first, and then pull apart the ribbon. When I uncovered the paper lid, a wonderful, heartwarming aroma filled the air around me. 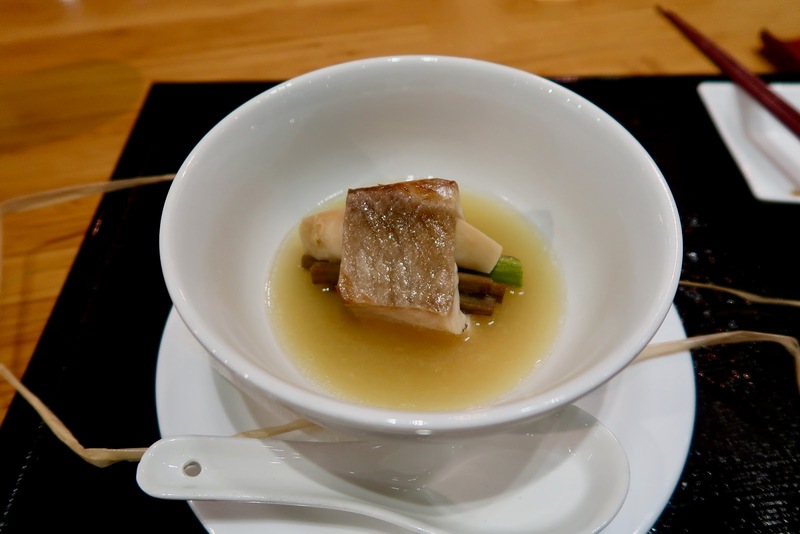 Inside was a piece of soft, silky sablefish accompanied by some juicy asparagus and various mushrooms for additional depth of flavour. Though I've had softer and meltier sablefish in the past, the smooth texture of this one and the fullness of the broth made up for it. The one item that blew me away was the Golden Roll, one of Tojo's most expensive special rolls. The three pieces that you see in the picture above amounted to about $20 of my bill. 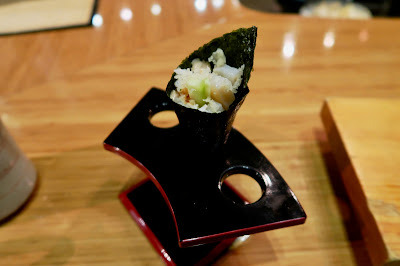 Using west coast ingredients such as salmon, scallop, spot prawns and Dungeness crab, this roll melted in my mouth like no other roll I have ever had. The heavenly sweet scallop went perfectly with the soft egg wrapping, and this was contrasted with a small helping of crunchy caviar atop each piece. The flavours of this roll were neither bold nor especially innovative. It was the precision that made it the sole highlight of my entire dinner. Just prior to handing me this dish, Chef Tojo was trying hard to get the ikura (salmon roe) not to fall off. He succeeded, but just barely. In either case, the ikura was a success. 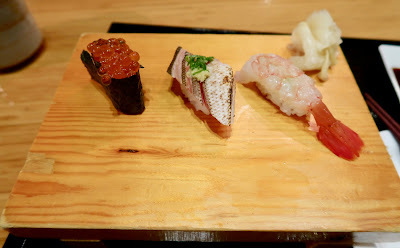 The seaweed had a special roasted flavour to it, and the fish oils in the ikura were savoury. 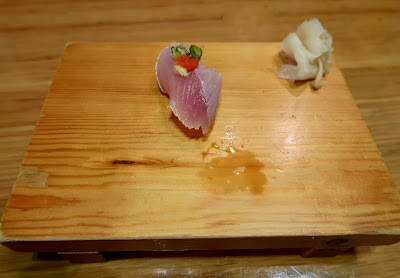 The Barracuda Nigiri had a nice zing from the green onion and ginger on top. It had a lightly smoked flavour and a delectably smooth texture. The Spot Prawn Nigiri was very fresh, creamy, and meaty, though it was a bit heavy on the wasabi. After the three pieces of regular-sized nigiri, I was presented with the jumbo-sized Anago Nigiri (sea eel). It was designed to be cut in half and then eaten as two separate pieces. 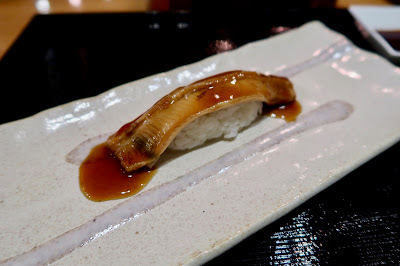 The steamed, warm piece of anago was very soft, though I thought it could absorb a little more of the sauce. This piece of nigiri was where the sushi rice stood out the most. The texture was just right, and it was almost in line with the sushi rice at Miku and Octopus Garden. In a bold move, Chef Tojo presented me the Geoduck Cucumber Temaki, which he boldly dressed with spicy mayonnaise! The dressing worked, and the seaweed had the same nice crunch and roasted flavour as the seaweed from the Ikura Nigiri. 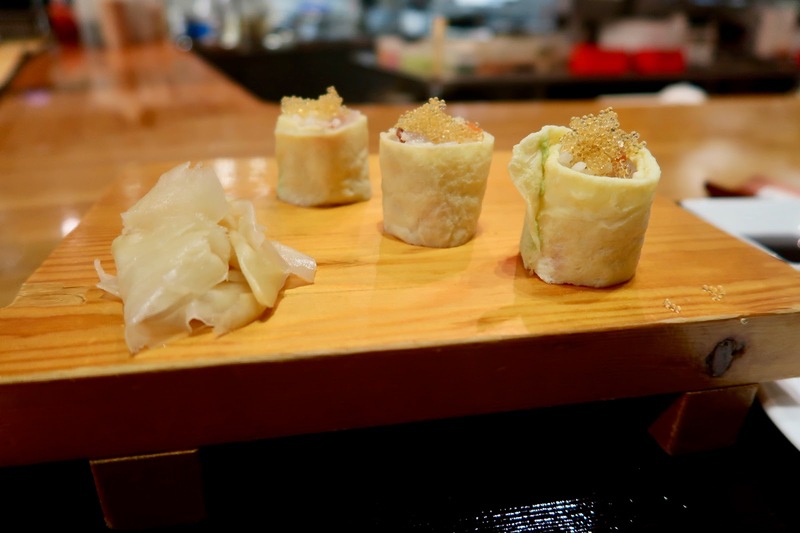 The geoduck had an appealing crunch to it, though with so many different ingredients going on, it was difficult to discern the distinct flavour of geoduck within the cone. By this point, the restaurant became busier than when I had just arrived. It seemed to me that in an effort to entertain the other omakase diners, Chef Tojo was starting to lose his focus on the food. The precision started to go down, and the magic began to fade. I was also having to wait longer and longer between each dish. I called for one more item and then dessert. 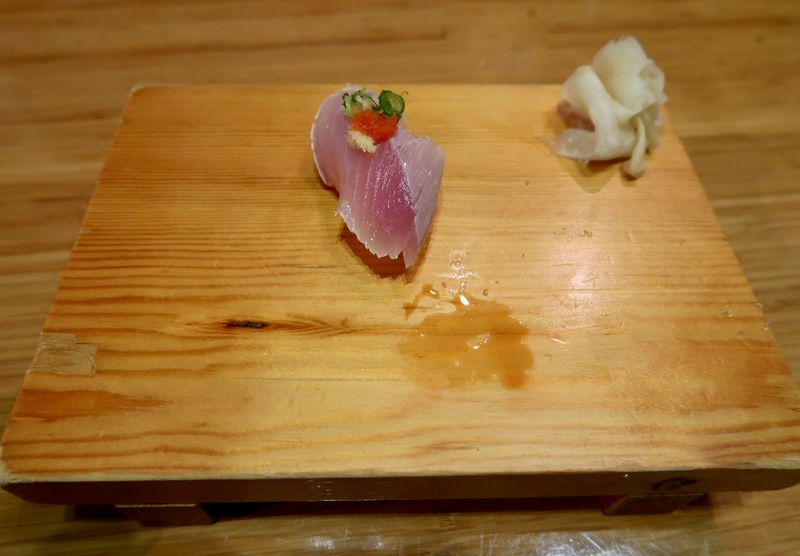 My last item was one piece of lightly seared Local Albacore Tuna Nigiri accompanied by green onion, ginger, and grated daikon. As expected, the tuna had a wonderfully soft texture. However, the tangy dressing and savoury flavour of the tuna did not really mix together. I could not taste any smokiness from the searing of the tuna either. 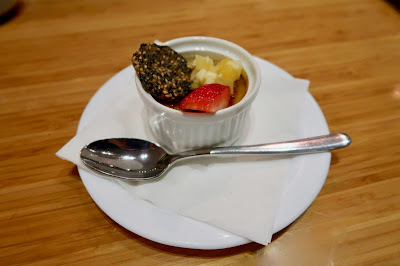 Finishing off the meal was the Green Tea Crème Brûlée, my favourite dessert. This one was accented by a sesame cookie, Tojo's signature daikon and apple combo, and a slice of strawberry. The sweet flavours worked together well, and the green tea flavour was well-distributed throughout the custard. However, the crème brûlée ended up being slightly drier than expected. ...$216.30! In all fairness, they did tell me multiple times before my dinner that the price was most likely going to end up in the $200 to $300 range. The wait staff was more than professional. Multiple servers treated me with utmost respect and made sure that my plates were taken away as soon as I had finished each item. Yes, I know what you're probably thinking right now: Was it worth it? If my dinner was $100, my answer would be a definite "yes." $150? Probably. However, $216.30 was a little excessive. Indeed, I have never experienced the same level of consistency at any other sushi restaurant in Greater Vancouver, and the precision was among the finest I have encountered. However, for that price, there weren't as many dishes that blew me away as I had hoped. I suppose there is a premium for the experience of dining in front of an internationally famous chef. It also seemed like there was a significant premium to sit at the sushi bar. 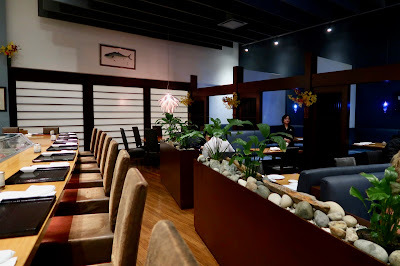 I looked at the menu once more and noticed that I could have gotten significantly more food by ordering the 5-course omakase ($80) and the 6-course omakase ($120) simultaneously. 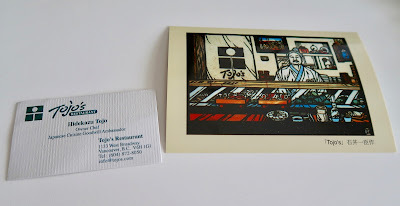 As I headed for the exit, I received two souvenirs: Chef Tojo's special business card and a glossy postcard. I asked if all omakase diners received these, and the wait staff told me "no." Apparently, these are only for special guests. Well, at least they made me feel special! FANTASTIC post, Raymond! One day I hope to eat at Tojo's as well, but with those prices it will definitely have to wait a while. And congratulations on your 200th post! Thanks, Kristina! I can't wait to read about your (possibly) drunken adventure to Tojo's! Also, I think when the staff answered you that not all diners get the business card and post card, he/she meant, not only the dinners get them, anyone can get them LOL!! wow damn I'm not sure if I will ever fork out this much haha but great post!!! 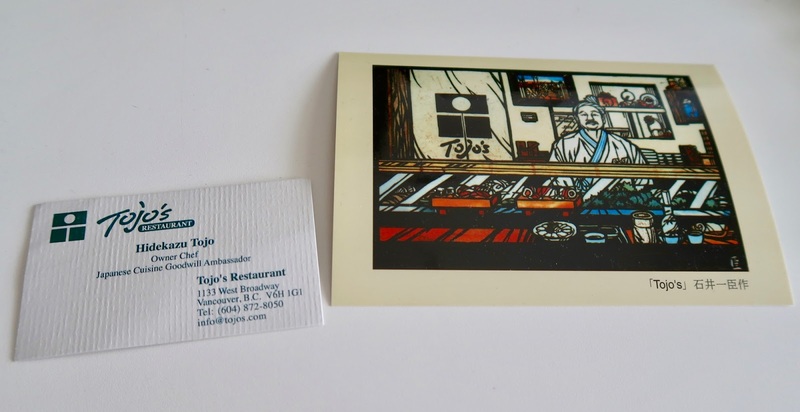 Congrats on your 200th post, and a most special meal at Tojo's, Raymond ! This is your pinnacle, your Mt. Everest (or Fuji ?). your ichiban moment. Glad you have shared this special write-up with us. @Puzzlefighter I tipped them $33.70 LOL. That's enough for a sushi adventure by itself! If it were for all diners, it wouldn't be special anymore! Thanks Naomi! I think most people will never fork out this much for one dinner LOL. Thanks LotusRapper! This was definitely my Mt. Fuji moment LOL. I won't be topping it anytime soon either. Glad you enjoyed reading about it! Yummm! Hopefully one day, I'll be able to afford going to this place! They do have cheaper omakase options available. I just "drunkenly" went for the most expensive one! Wow! Over $200! I'm not sure if I'm ready to pay such a huge bill :P but congrats on your 200th post! Keep up the great work! Thanks Idea Rabbit! If you want to try Tojo's for less, there's always the 5-course omakase or the 6-course omakase. I haven't tried them yet, but I think they might actually be better value!